When I got my first job out of college, I went through a free-spending stage before settling down and tying the knot with Dave Ramsey– I mean, Addison. While I wish I had been wiser with my money that year, sometimes I’m thankful for my free spirit shopping trips I’d take every now and then. One of those purchases was the Yonanas machine. And now, over a year and a half later, I have only one thing to say: It. Is. AWESOME. Basically all you do is freeze some bananas, throw it in the top, press down and WHAMO– it comes out like soft serve ice cream. Yes, my friends. This machines takes frozen fruit and makes it taste so decadent people mistake it for calorie-ridden, Italian awesomeness. I LOVE my Yonanas machine. 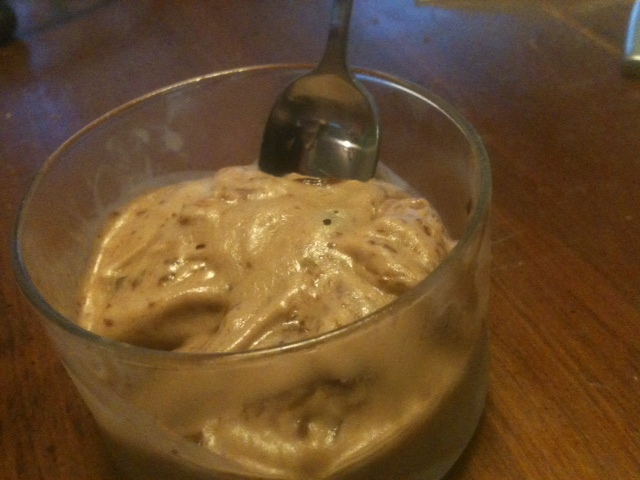 It’s great mixing chocolate chips in with it too. The other night, a friend of mine and I made some Nutella “ice cream” by simply throwing in some Nutella into the spout with the bananas. When it came out, I decided I wanted even more Nutella flavor so I mixed it in by hand, which created an AMAZING ribbon of chocolate hazelnut awesomeness. In case you’re wondering, I use the Libby mini dessert/appetizer bowls for portioning. It’s the perfect size for such a decadent dessert– especially when I have guests over. A few weeks ago, a had a friend over for dinner who is on Weight Watchers. As someone who is always trying to be careful of what I eat too, I can respect and sympathize how hard it is to eat at other people’s houses. I wanted to make it easy for her and made a Weight Watchers friendly chicken marsala with a Hungry Girl recipe. But then I started wracking my brain for some dessert options, flipped through my Hungry Girl cookbook, scoured the Internet for point-friendly recipes– but nothing seemed worthwhile. I mean, most of the recipes were around the same amount of points as the dinner I was preparing. What’s the point of that? Then it hit me. On Weight Watchers, fruits and veggies don’t count. Yonanas was the obvious choice. She nearly flipped her lid when she tasted the incredible texture and flavor of this 0-point masterpiece. 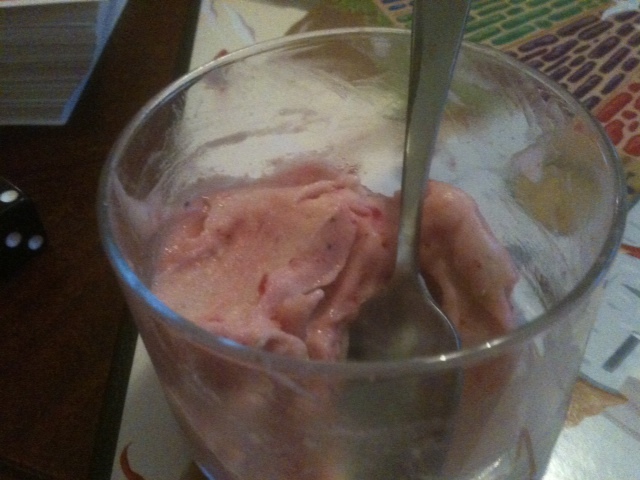 Again, I say…I LOVE YONANAS. And no, they are not paying me to write this. I’m just appreciative of complete genius that makes my life a little sweeter and healthier. (Supposedly you can achieve the same thing in a high-speed blender, but we don’t have a blender and from the pictures I’ve seen, I’m going to say Yonanas has a better texture).